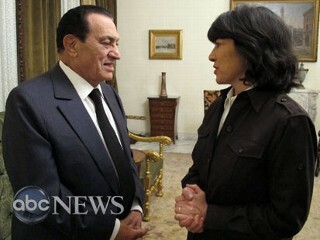 ABC's Christiane Amanpour reports on her interview with President Mubarak. I've just left the presidential palace in Cairo where I sat down for an exclusive 30-minute interview with President Hosni Mubarak. He told me that he is troubled by the violence we have seen in Tahrir Square over the last few days but that his government is not responsible for it. Instead, he blamed the Muslim Brotherhood, a banned political party here in Egypt. I asked President Mubarak about the violence that his supporters launched against the anti-government protesters in Liberation Square. I asked how he felt after giving the speech Monday night, saying he would not run for president again, and he told me he felt relief. The interview took place on day when the mood here is getting increasingly tense. This afternoon, my ABC News team and I left our offices in three cars and started a drive to the Presidential Palace. 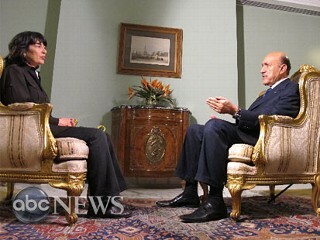 We had been granted an exclusive interview with the new Vice President of Egypt, Omar Suleiman. We had to take a route that ran through a neighborhood where there were pro-Mubarak supporters in the streets were setting up their own check points. When we got stuck in a crush of traffic, we were surrounded by an angry mob. For about an hour, we worked on negotiating our way out of the situation by talking and staying extremely calm. At one point a solider came up to us. We explained what we were doing and showed him papers that were an official invitation to the interview. Very, very, slowly the crowd started to fall back and our car was able to move. The other two cars in our convoy were taken to a nearby police station for safety. Nobody was hurt, nobody was attacked, but it was clearly an uncertain and unsettling hour. When we got to the palace, as our as our cameraman was setting up for our exclusive interview with Vice President Suleiman, I asked if I could see President Mubarak. Within what seemed like just minutes, I was whisked into a reception room where he was waiting. He greeted me warmly, and we started to talk. He looked tired, but well. He told me he felt strong and that he was relieved he had made his decision and that speech on Monday to step down. I asked him afterwards whether I could report our conversation. He said yes. Mubarak remains for now in the presidential palace with his family, heavily guarded by armed troops, tanks and barbed wire. We were joined by his son Gamal, who was once widely considered to be his successor. Mubarak told me it was never his intention to have his son follow him into office. And he pledged his loyalty to Egypt. "I would never run away," he said, "I will die on this soil." He also defended his legacy, recounting the many years he has spent leading his country. While he described President Obama as a very good man, he wavered when I asked him if he felt the U.S. had betrayed him. When I asked him how he responded to the United States' veiled calls for him to step aside sooner rather than later, he said he told President Obama, "You don't understand the Egyptian culture and what would happen if I step down now." He told me, "I never intended to run [for office] again. I never intended Gamal to be president after me." Gamal, his son, was sitting in the room with us as he said this. Do you have questions about the mass protests in Egypt? Submit your questions to Christiane Amanpour HERE. Follow Christiane Amanpour on Facebook and Twitter.